This is something that always plays at the back of my mind when signing up for a certification. I remember once I was considering getting Agile certified. I did some digging and realised that it was going to cost thousands and required a yearly renewal! So when I approached the AWS certifications I wanted to know the real cost of getting this certification. Not only the cost of taking the exam, but all the things that come with it. Such as courses, training and mock exams. All these add up to the total cost of getting AWS certified. 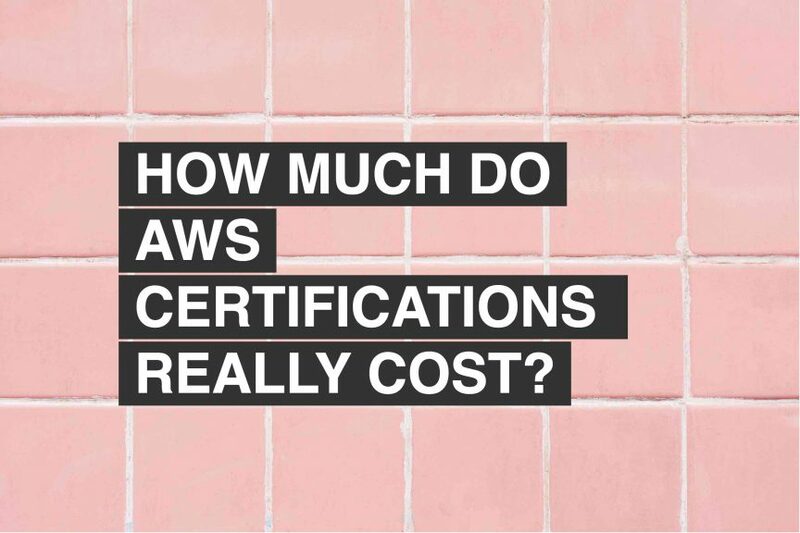 The AWS Certifications themselves cost anywhere between $150 to $300. This does not take into account the additional cost of the learning materials required to pass the exam. This can vary wildly from $0 to $2095. That’s the textbook answer, but if you keep reading I’m going to show you have you can get certified on any budget. Ok, we need to get this out of the way first. I might sound like I’m stating the obvious but, depending on the student in theory you can pass any and all of the AWS certifications with no prior study. IF and this is a big if, you already know AWS extremely well. So that students overall cost would simply be the price of the exam. This won’t be the case for 99.9% of people taking these exams. What’s more likely is you’ll need to do a combination of learning, revision and practice exams. This is what most people would do and I was no different. So In this article I’m going to outline 3 potential routes you could take depending on your budget when taking one of more AWS certifications. Ok this is in my view the absolute cheapest possible preparation you can take in order to have sufficient knowledge to pass the exams. Obviously the level of study will differ between the certifications you will study.But the approach should be the same or similar. AWS offers a number of free courses via QuikLabs. Check Out their homepage here. You get access to 19 free courses that last approximately 30 minutes each. No bad for free! In this instance, google is your friend. After an hour of searching I managed to compile this list of resources you could make use of. I found this resource when looking for free resources and was pleasantly surprised. Basically it’s a massive single page document describing all the major features of AWS. Forums are always a good place to answer specific questions. For the cheap route, the cost is just the price of the exam! All the resources listed above are free. This is the route I think most people will take. It’s the route I took in fact. I feel that if you’re going to invest $100+ dollars and a substantial amount of time to study for the AWS certifications then it makes sense to invest at least a few dollars into courses and resources that will genuinely help you pass your exams. In my mind the biggest bang for your buck is to invest in a good course and some high quality mock exams. If you pick the right ones, then they aren’t expensive and it’s going to cost you around $50. That investment will provide you with a course that will to completely focussed on the exam you are taking. I followed a course by aCloudGuru when taking my architect associate exam. I purchased it via Udemy when they have one of their regular sales. It cost $20 and is worth twice that in my opinion. aCloudGuru aren’t the only show in town though. He’s a list of other options. I haven’t taken these courses so I can’t vouch for them. My next and last investment would be to buy a quality mock exams. There’s a bunch of companies that offer these, including AWS themselves. My recommendation would be to purchase a WhizLabs mock exam set. Those guys do a great job and the software they use simulates exam conditions. Making the mock feel that much more real. In terms of cost, you’re looking around $25 for a set of mock exams. The cloud practitioner one had 3 complete mock exams which made passing the exam a sinch. This is the route people take most often when their company is paying. I mean who has a couple of thousand dollars to spending on courses in their spare time! Big companies tend to have budgets for training up their staff. If you’re in this position then signing up for a course that involves face to face training or possibly a virtual class can make a lot of sense. You get the benefit of speaking to experts in AWS certifications and they’ll answer questions immediately instead of you having to dig through the internet to find an answer. It can cut down your learning time. But it won’t mean you don’t have to put the hours in and study! I attended a webex virtual class when I passed my Spring Framework certification around 6 years ago. It was a big investment for me at the time. But the benefit of being able to ask the instructor questions directly was priceless. Virtual classes are useful if you can’t get to a classroom. As long as you have a reliable internet connection you can connect anywhere. You get a lot of the benefits of being in an actual class room like for instance instant feedback on question from an expert. The only downside to this approach is the actual cost of these virtual classes aren’t that much cheaper than actually going to a classroom. Just keep that in mind. You see prices around $600 and if you’re timezone is different to where the class is being hosted then you’ll have to adjust to follow suit. Traveling to a location, spending anywhere between 3 – 6 days there to complete a crash course training program on passing a particular certification or learning a specialist part of AWS. These range in price depending on the duration of the course and the location. But expect to pay north of $1000 for these classes. It totally depends on your budget. If you have a big company backing you then go for the baller option and purchase a classroom taught course. If you were in the same position as me and on a budget then I say go for the online course and mock exams. It takes out all the guesswork at a bargain price.